Revital U provide no information on their website about who owns or runs the business. The Revital U website domain (“revitalu.com”) was registered on July 15th, 2016. Pat Johnston is listed as the owner, through an address in the US state of Texas. On his LinkedIn profile, Johnston cites himself as President of Revital U. Further research on LinkedIn reveals Andrew McWilliams citing himself as CEO of the company since late 2016. On Twitter McWilliams (right) confirms he is also the owner of the company. Williams appears on Revital U’s social media profiles, so why executive information isn’t disclosed on the Revital U website is unclear. McWilliams first appeared on BehindMLM in 2016, as CEO of Momentis. Prior to launching Momentis McWilliams was an affiliate with ACN and LuxuriLife, a purported $3500 a pop recruitment scheme. Since our 2016 review, Momentis appears to have collapsed. Today attempts to visit the former company website returns a hosting error. Read on for a full review of the Revital U MLM opportunity. Revital U market coffee and “Smart Caps”. As per the company’s website, their coffee ‘is designed to energize you from within‘. With only one scoop a day, you can begin feeling physically alert, experience better mental focus and help with your weight management. support your daily routine by activating the best version of U! With only one capsule a day, you can begin experiencing an uplifted mood, increased physical and mental energy. 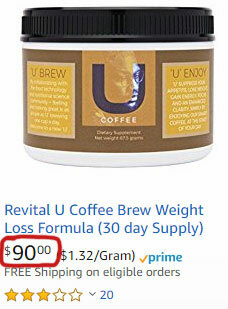 Revital U coffee sells for $49.99 for a 30-day supply tub or $54.99 for a box of thirty single-serve sachets. Smart Caps retail for $49.99 for thirty-day supply. Both the coffee and Smart Caps are available at a discount on monthly autoship. The Revital U compensation plan combines a strong retail customer focus with residual unilevel team commissions. Residual commissions are paid out based on rank, over multiple levels initially with a generational cap introduced through rank progression. There are eight affiliate ranks within the Revital U compensation plan. An active retail customer is a retail customer who has made at least one product order that month. Active group retail customers are an affiliate’s own active retail customers and that of recruited affiliates in their downline. PV stands for “Personal Volume” and is sales volume generated by retail customer orders and an affiliate’s own personal purchases. Revital U affiliates are paid a commission when they sell products to retail customers. The retail commission rate is variable and determined by how many active retail customers a Revital U affiliate has each month. To count towards the monthly quota, a retail customer must have made at least one product order that month. Note that new Qualified Brand Influencer ranked affiliates earn the 10% retail commission rate for their first sixty days. The New Customer Bonus is a retail bonus that rewards new Revital U affiliates for generating retail sales. Retail customers must be generated within a new affiliate’s first thirty days. Revital U pay residual commissions via a unilevel compensation structure. Within this unilevel team structure, Revital U track affiliates at a lower rank and then at the same or higher rank. Sales volume in each unilevel leg is paid out using a combination of two payment components. The first component is a residual commission rate determined by rank and paid out up to the first affiliate in a unilevel team leg at the same or higher rank. Once this affiliate is found, Revital U switch to a generational method of commission calculation. An affiliate at the same or higher rank deeper into the unilevel leg counts as one generation. Note that generational volume is paid out only on this affiliate’s volume. It is not paid out on volume between generational affiliates. I.e. if you are a National Brand Influencer and you have two Global Brand Influencers in a unilevel leg, you would earn the generational bonus on those two Global Brand Influencers. If they were on different unilevel team levels of that leg, let’s say levels 4 and then 10, you don’t earn residual commissions on lower ranked affiliates on levels 5 to 9. In a nutshell a Revital U affiliate earns a flat residual commission rate on each unilevel team leg they have, up until an affiliate at the same or higher rank is found in a leg. From there a generational calculation is used, with volume from each same or higher ranked affiliate deeper in that leg used to calculate a generational commission. Towards the end of the Revital U compensation plan there’s a section on Team Achievement Bonuses. The copy suggests these are month to month bonuses, based on new monthly retail customer volume counted from lesser ranked downline affiliates. Generation of this volume can pay as much as an additional $50,000 bonus each month (Global Brand Influencer generating $1,500,000 in new retail volume). I haven’t broken down the entire bonus structure however because there’s no indication whether this is a limited time bonus or ongoing. The Revital U compensation plan cited for this review lists the Team Achievement Bonus as a “May 2018 promotion”. Revital U affiliate membership is $49.99. When I first dove into Revital U’s product lineup, I came away feeling underwhelmed. It’s coffee with additives and a caffeine pill. All the rage five or six years ago but would it still cut it in 2018? Thankfully that’s about my only concern with Revital U, which for an overall impression of an MLM opportunity is refreshing. Revital U’s compensation plan is heavily rooted in the generation of retail sales. The sliding retail commission rates are great and affiliates can’t earn residual commissions unless they’ve got at least two active retail customers. An affiliate’s own purchases can add to their retail quota, but given it’s one customer out of eight and then two out of nine or more, not really an issue. To increase residual commission rates a Revital U affiliate has to rank up, which requires building a solid retail customer base and encouraging downline affiliates to do the same. This is exactly what you want to see in an MLM company regarding compensation and business focus. One thing I’ll point out with respect to affiliate rank criteria is the bouncing between focus. Rank qualification starts off with acquiring retail customers and then adds specific rank recruitment criteria. At the Regional Brand Influencer rank focus is then switched to total downline active retail customer acquisition, with the next two ranks switching focus back to specific rank recruitment. Platinum Brand Influencer tops things off by discarding specific rank recruitment and just requiring six affiliates of any rank. Strong active retail customer quotas at each rank mean neither of these changes are necessarily negative, I just think the requirements could flow into each other a bit better. I imagine the initial idea was to have affiliates at different rank focus on different areas of their business. What it instead feels like though is having to completely switch direction and focus for some ranks and then return to what you were doing a few ranks later. Perhaps keep what’s there but increase what’s required per rank rather than switch up downline requirements every few ranks. Retail customer requirements and PV progression throughout the ranks is a good example of this done right. Other than that Revital U’s compensation plan is built around retail sales and if you can’t pull in the customers, you’re not going to get anywhere. Which brings us back to the coffee products. Our Coffee is designed to energize you from within. With only one scoop a day, you can begin feeling physically alert, experience better mental focus and help with your weight management. Take it as regular coffee or mix it into other drinks and foods, at breakfast time! It contains a similar amount of caffeine as regular coffee – 100 mg. When taking the recommended daily scoop, a tub will last 30 days. Our Smart Caps support your daily routine by activating the best version of U! With only one capsule a day, you can begin experiencing an uplifted mood, increased physical and mental energy. It’s convenient packaging allows you to take it wherever you go. Take a Smart Cap with your breakfast or after lunch for a mid-day boost of energy! A Smart Cap contains 150 mg of caffeine, the equivalent of a large cup of regular coffee. When taking the recommended daily capsule, a box will last 30 days. Where is the hook? 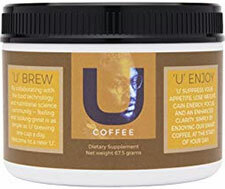 What differentiates Revital U’s coffee from what I can buy locally? If the goal was just to sell regular coffee, a five second search on Amazon reveals competition for coffee capsules is steep (a ton of options coming in at less than $40 a month). Regular coffee is available anywhere, so compare what’s available to Revital U’s $49.99 a month offering. And speaking of Amazon, what is this garbage? Selling coffee that retails at $49.99 for a $40 markup? Yeah… Revital U corporate might want to look into that. Carving out a retail market I feel is going to be the biggest challenge Revital U affiliates will face. Coffee is a highly competitive market both inside the MLM industry and out. Manage to overcome that hurdle though and you’re looking at an MLM opportunity with a refreshingly strong focus on what matters – retail customers. KS: "My sponsor set me up in the trading software and within 6 weeks lost over $900 on my $1,00)..."